Last months I have learned a lot about those guys. Some of their apps have been removed by Google from Google Play (Android Market). In some cases Google has asked me about further documents and warrants. Anyway it looks that Google is on the light side of the force. But the best way to make money in the development is to keep working on your new profitable projects. I have decided to deal with brainless copy guys and keep building new income sources. That's all about reasons... Meantime I had enough time to rethink how this blog should look like to keep away most of the easy money lovers. I do not want to post all of my income breakdown as it brings too much wrong people here. So there will be no more public breakdown of my month by month earnings. But... I will keep posting my total from Mobile Development and "The Rest" without further details. You may expect progress reports with such info and other interesting news about my current development plans and ideas. More detailed breakdown will be available in the restricted password accessed area of my blog. From last few weeks each of my eBook buyers has been asked to register with login/password to download the eBook. Same login data gives them access to my restricted area that will have more detailed breakdowns, tips and forum to ask sensitive questions that I do not want to reply in the blog comments (all of this is in preparation). If you have bought the eBook before login system has been created please contact me with your transaction ID (via contact form) and I will assign you a one. Of course from now on each purchase gives you access to that area. Currently there is only eBook download link but all will be posted in the coming weeks (with info on the public part of the blog). Another thing that will be coming in the next weeks is the big update of the "Make Money on Android" eBook. I am preparing some valuable information that will be added to the eBook (and updated of course). Current eBook price is $19.99. That gives you access to the restricted area and all updates of the eBook lifetime! After update the price of the eBook will go to $29.99 (the restricted area should be ready till then). New information that will be included has multiplied my current income. Want more? Keep following my blog and I am sure that you can benefit from it! Comments as usual are welcome and strongly desired! Great to have you on board! I think that all of us will benefit! I’ve purchased the book before. Will I receive update of also? I am really sorry for what has happened to you. It is really wrong when people copy paste ideas and don’t even change anything. But there is one thing i still don’t understand, What has publishing of income reports got to do with copyright issues? Do they copy paste apps that tend to generate more revenue for you or what?? What of those who used to follow your blog just to get motivated with the numbers? Then do you think availing this info to only the selected few who have bought your ebook will prevent the cheating?? What will stop these people who are stealing your ideas from buying your eBook and getting this info which you are unwilling to provide anymore? It brings to many people that are interested only in the big numbers. If I restrict it to eBook buyers all info will not be as easy available around and it will be more precious to people that paid for it. Moreover most of people that copy&paste are kids that after they see the blog post they just copy everything. People that buy eBook are more serious as they invest some money to learn. Moreover I know who I deal with in the closed community. Okay, i see. All the best then! on my way to makingmoneywithandroid.com until i get the $20. Thanks David, good to read some positive words. Unfortunately it is the cost of being to open to public. I am facing the same situation with a near copy of my app. What did you do to protect your apps? Cool, i will be checking out your general progress. All the best man! Hi KreCi, how can I get the access to your restricted area? Since I can’t see anything on the eBook web page(there is just a “Premium” link on the top). Just as written on the post it is not ready. I am still working on it. Give me a few days to setup everything. Basically what your model is creating an app then sell the ebook about how to make money with the mobile app. My dear why are you not directly invest in blog writing? You make more by writing a blog. Income from eBook is just a nice addition to my base money earner that are mobile apps. Nice to hear about you again, this will help me with motivation to continue learning android apps development! I’ve bought your e-book, the private section can be a great place to share tips with all developers that follow your website. I bought your ebook few months ago. And I want to have username/password to access retrict area of your blog. Could you please help me create an account to access it, and also give me the link of retrict area. Replied via email. Good luck! did send u my ID of recite for book i bought from you. when i will receive login info? Check your email. Sent it a few minutes ago. Being copycat is the most successful business method of 2000s. It is natural to copy the apps and polish them with higher quality graphics and added couple more functionality and become successful. However I do not talk about exact copies same graphics and %100 same functionality. It is like Android copied apple’s main system, apple copied android’s notification system (EXACTLY SAME, loll). Everybody copies everybody. Angry birds or cut the rope are original?, Definitely not, I played exactly same games years before in flash websites, all they did add new graphics and hit the market at right time. Funny thing is, look at your library of apps, most are copies of ones that were already out there. Are you telling me you are the first person to come up with ‘cracked screen’ or ‘fake X-ray’ give me a break. You may be surprised but yes. My “X-Ray Scanner” was first app like that on Android devices. “Cracked Screen” was first one interactive app like that (that can do anything more than showing a photo). Moreover I just have told you my reasons for this decision. You do not have to agree with it. Your apps are pretty old, so it may be true you can be one that uploaded to markets first, but the concept of cracked screen or x-ray scanner were there long before. If you want to say “I found idea”, you should develop such a unique apps. I do not say about concept. But about copy&paste of each function and most graphics. There are apps that has same icons with just changed colors. Same description and exactly same functions without any changes. Did you start using Airpush for ads? Nope. No Airpush. But I am using Leadbolt that is performing great. Kreci is copy/paste developer, his e-book has only 1 good tip about **************** – when AdMob earnings dropped – he decided to earn on LeadBolt refferals (he will earn 10% income made by everyone who use his refferal link). If an idea is not patented by someone or company, anyone can do similar stuff, we call this business. One my friends earns $10,000 – $15,000 monthly from copycat apps. What does he do is getting apps which has potentials and perfecting them with maximum functionality and highest quality graphics. I do not know about the book, I wont comment on that. I follow Kreci quite a good time, I admire his work, I learned many things from his articles. I never comment before, beacuse I didnt see any need. However, when Kreci said people copies my apps, I had to comment about it. Keci, you sometimes do copycat staff and there is nothing with it. You cleared a path so it’s not surprising many have chose to follow in your exact footsteps rather than attempting to find their own way through. I’m just surprised you’ve continued this long. I think David from makingmoneywithandroid.com is another example of why it’s best to keep a valuable idea quiet.. (and also a great example of continuing to try until you make it) his fake iphone app was unique until his blog post about its success, I’m sure in hindsight he regrets being so open.. everyone inevitably does. I recently bought your ebook, and it has got a lot of good tips, I hope that I bought it, i will be able to buy an updated version. My questions are the following: Are you using adsense inside admob? How the hell can you get so high CTR???? Hello. You will get free update if you bought it already. Yes I am using adsense and CTR depends from the kind of the app. Moreover it is not as good lastly. Could you elaborate on “LeadBolt over AirPush” topic? I have not implemented AirPush. Based on other opinions I am using LeadBolt. I was already expecting this move a long time ago. Showing off with earnings on a public website is not a good idea in my opinion. Off course you’ll draw alot of copycats. There will always be copycats, but they’ll have a hard time getting popular vs an already popular app. People recognize copies. Unless they improve their copy with nicer gfx and much more functions, then it’s not a real copy anymore :). Anyhow best move you could make. Thanks for understanding. Good to hear that! I agree with your decision. Your income reports for months and months already motivated a lot of people that visit this blog regularly. You should have started with the progress report from the beginning instead of detailed income report. people who buy your book wants to learn how to make money with free apps, and your book delivers! There is an ebook I forgot its site, but I was shocked to know they got banned from android market, and they blogged about it. I am glad I did not buy that book. But they sold it I think for the same price as yours, but not all these income report. You already outdid what others did. I bought an ebook from Eddie Kim, marketandroidapps.com. A good one. He doesn’t share income reports, If i am going to blog about my android app biz, I would never share the income reports, maybe a screenshot of the leadbolt once in a while. And i would never ever share my apps, as I can see that one of your student, who you blogged about before has his own crack my screen app! 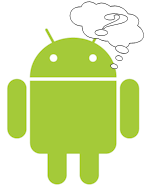 Android programming is getting more easier with experience, so no point in cloning others exactly. You can clone their apps, but not how they make money. If you can clone how to make money of apps, you know what apps to create! Great to see a post from your Kreci, keep up all the good work! Good to hear such comments as well! Thanks! Hi kreci. Have anyone complained about notification ads on their phone? I’ve heard that lots of people didn’t like this kind of Ad because it’s so annoying and can’t stop the ad showing although they closed your app. Some apps that use Airpush has been reported as spam and brought down from market because of their notification ads. I agree with you on a much higher eCPM but I’m too afraid to integrate Airpush/Leadbolt to my app. You need to do it right way. At first I made some mistake with bad integration but fixed it and now it is making good money with no (or really not much) bad reviews. I will blog about it in a few days. Really hope you find a solution that’s profitable for you. Your reports are the reason I got into this business and I still get important insights with every new one. Looking forward to the new model. you call your self developer,please dont insult me. While I am disappointed you won’t be posting monthly income reports any more, I totally understand and respect your decision. Sadly most people can’t see beyond Dollar signs and in their minds think if they duplicate your apps they will start making the same money as you. What’s sad is that these copycats could use their programming skills to create a useful and original app that could make them even more money than what they see in your income reports – but they lack the self-confidence or creative thinking to come up with something new so they stick to mindlessly copying stuff that works. I enjoyed the earnings reports, too. Yours and Bingo Card Creator’s inspired me to post similar reports on my flash game earnings (but I never broke $10). I’ve also seen copy-cats and downright copiers. In fact my own blog where I released one of my games is outranked in google by sites hosting copies of it. I guess the solution is to have a server side component in the product, eh?